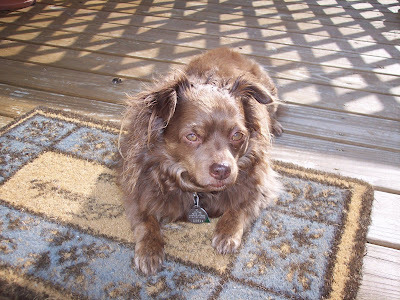 Here's my sweet little Milo taking some time to relax on the front porch. He spends most of the day resting, snuggling, playing and very importantly, protecting the family. Doesn't he look tough? Okay fine, maybe he looks like a sweet little softy but he really is a good dog (shhh, nobody must tell him he is actually a dog). He is very gentle with his baby brother and really never gets in any trouble. I think he listens better than the rest of the family! My father-in-law says that Milo lives in the lap of luxury and would not be able to survive if he had to live a dog's life. Sadly it is true. I am ashamed to admit this but for the first month of William's life, I called him Milo. It took a while to etch 'William' into my head! I just love my other little son Milo!! **I'm sure the question will be asked...What kind of dog is he? He is a pure bred long coat Chihuahua. he's so cute! and no no, not an actual dog. and I call my kids miles all the time... my baby. Nah...I wouldn't say he looked tough [lol] but he definitely looks like he means business :-). I love his eyes by the way!!! We had the same issue with Caesar! We were so used to calling him Mr. Poosh, we slipped up and called Jayden some variant of poochie or pooshay. My mother even did it, lol! I almost called him Mr. Kittyman too since I'm so use to saying that to our cat, Simba. Pets are children too!